When a veteran of Napoleon’s cavalry is targeted by Prussia’s secret police in 1836, he must face his own demons, evade the authorities and take his family across the ocean to carve out a new life on the untamed edge of America. 1836: Escape to America illuminates intricate family relationships amid the upheavals of tyranny, war and slavery with intriguing glimpses of 19th Century Germany, Holland, Gibraltar, Cuba, and a newly independent Republic of Texas. The family's arrival in New Orleans and their travels to Chicago form the basis for Book 2 of The 1836 Series, 1837: Among Strangers. At that time, New Orleans was almost entirely French; Chicago was an infant boom town; and the rest of northern Illinois was on the wild edge of the American frontier. Whether you know anything about your ancestors or not, some brave souls among them probably risked everything to make a journey like this. Their story is probably like this one of leaving the Old World behind and building the New World from scratch, a story of wrenching loss, unforeseen dangers and narrow escapes, of weeks, months or even years on the road, and of very hard work and unprecedented opportunity. If it has been a generation or more since that fateful journey, you probably live in a world of health, wealth and possibility that would have been an impossible fantasy to your grands or great-grands or perhaps even your parents. Their stories deserve to be our benchmark for risk-taking and bravery and determination and of the simple hard labor required to build a shockingly different and better nation for ourselves and for our families. Much of historical fiction focuses on favorite eras, like the Ancient Egypt, the Regency, or World War II. In a sense, my era chose me. I had a good story to tell, backed by private family documents, and I came quickly to believe in my choice. It lets me tell about individual immigration journeys -- all were arranged by individuals before the huge immigrant waves from Ireland and Germany began about 1840. Just a few years later, so many people were traveling that things changed rapidly, from agents providing multi-part tickets to trans-Atlantic steamships and transcontinental rail. The trip recounted in 1836 was outlined by my documents and among the last of its kind. As such, it illuminates important transitions at the dawn of the industrial revolution. The 1836 Series is a real story, albeit fictionalized. It is not time travel or historical fantasy, romance or murder mystery. All of those are fine, but the real thing is amazing enough. As I did research I kept thinking, "You couldn't make this up!" Although the series is fiction, my goal is to make the historical detail as era-accurate as I can. Imagine my excitement when I found a spectacular painting done at the right time and place, Rotterdam, the embarkation port for the 1836 voyage. It's The Rotterdam Ferry, painted in 1833 by famed English artist, J.M.W. Turner. As soon as I saw it, I wrote another scene in Rotterdam in which the family takes the ferry from the inner to outer harbor. Perfect! The Rotterdam Ferry put me in search of period paintings for each of The 1836 Series books. My luck continued with paintings of the Yellow Stone riverboat on the Missouri River. 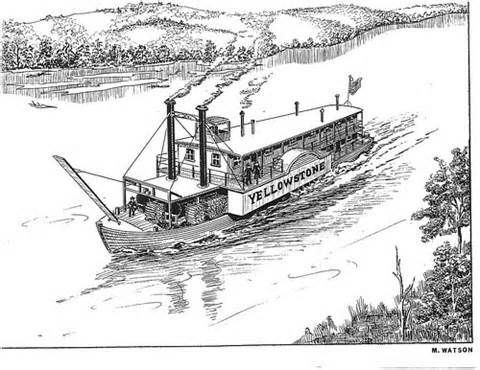 I had already written the Yellow Stone into Book 2, 1837: Among Strangers, because it was one of the few steam-powered paddle vessels going all the way upriver to St Louis. 1836 is early for steamboats; most in New Orleans were built for work in the harbor or short trips to nearby plantations for cargos of cotton, sugar or rice. ​ The Yellow Stone was already famous by 1836, having been built in a sturdy, no-nonsense way for the first riverine exploration of the upper Missouri and having fought in Texas for the newborn republic early in 1836. It was the subject of several paintings of the era. Here is Karl Bodmer's The Steamer Yellow-Stone, painted during his journey of discovery with Prince Maximilian of Prussia in 1832-34. It shows the Yellow Stone being hauled off a sandbar. In my book, 1837, the Yellow Stone narrowly escapes being grounded on a sandbar. M. Watson's drawing of the Yellow Stone is wonderfully detailed. Such paintings and drawings were the "photographic" record of the era. 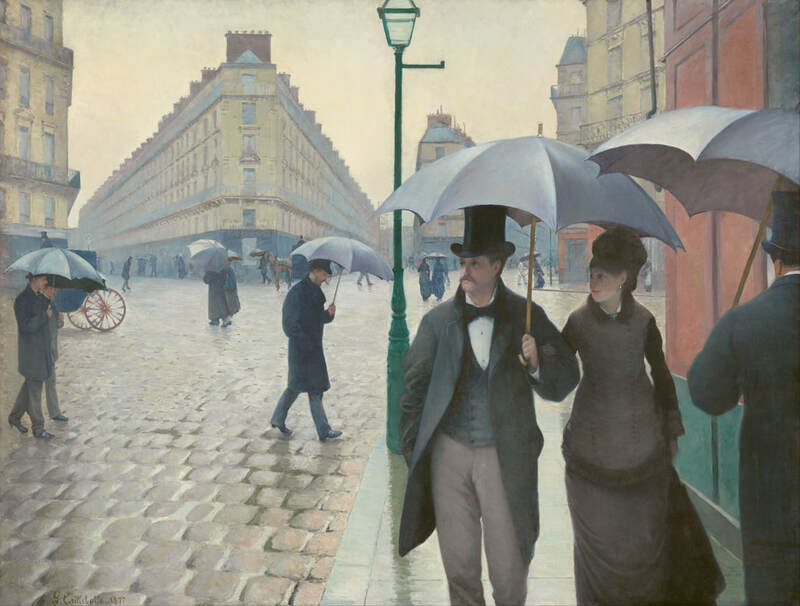 Book 3 of The 1836 Series is centered around a key date in the family's life in America, when a husband and wife travel back to Germany and France, a story inspired by Gustave Caillebotte's Paris Street; Rainy Day, painted in 1877 and now hanging at the Art Institute of Chicago, near the family's American homestead.